This is a medium to tall plant, which can be used equally well in a border or as an accent plant. 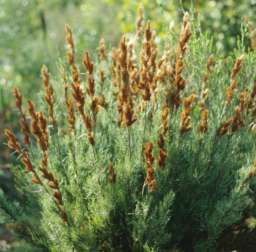 The plants are very decorative with silvery foliage like branches and tall silvery or golden brown inflorescences on velvety stems. They are evergreen and low maintenance plants suitable for normal garden conditions. Thamnochortus cinereus is a tufted plant with a fairly small diameter at the base of the plant, from which the stems fan out to form a rounded shape, about 1 m in height. The tall male inflorescences can reach a height of 1.5 m above the foliage. Members of the Restionaceae family do not have real leaves but the sterile branches at the nodes of the main stems look just like small, needle-like leaves. The plants can be treated like small shrubs or perennials and should reach an age of at least seven years if they are grown in a suitable spot. They normally start flowering during May or June in the southern hemisphere and the seed ripens during December. A two-year old plant can already be in flower and at three years old, the plants are at their decorative best. Thamnochortus cinereus grows in a wide range of conditionsin the coastal mountains of the southern part of South Africa from Port Elizabeth to Swellendam. It is one of the most common specieson the cooler south-facing slopes of the mountains, where the plants get a fair amount of rain or mist. The soils are mostly well drained but the plants also grow along streams or in seeps where the underground water runs. Although the plants can grow in fairly wet conditions, they would not be suitable for a bog garden or at the edge of a pond where the water is not moving underground. The plants mostly grow in full sun but can tolerate light shade during part of the day. They are not frost tolerant and require Mediterranean growing conditions, i.e. mild, wet winters and hot, dry summers. The genus Thamnochortus is quite large, there are approximately 31 species growing mostly in the southern part of South Africa. It is part of the family of Restionaceae, which is widespread throughout the southern hemisphere and can be found in places as far apart as Australia, Madagascar, Indo-China and Chile. The family name of Restionaceae refers to the Latin restis, which means cord or rope and alludes to the use of the plants in southern Africa. 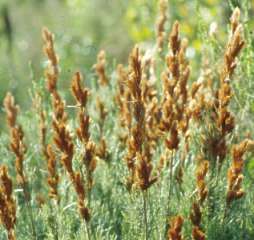 The species in this genus are mostly tufted plants, but some have creeping rhizomes with stems which pop up some distance from each other. The height varies considerably between species, some are only 300 mm high, whereas T. spicigerus and T.insignis can reach heights of 3 m with a diameter of also 3 m. T. insignis is the only member of the genus which is of considerable commercial value and is widely used for thatching roofs. The species name cinereus refers to the silvery colourof the female bracts. Like all restios, the male and female flowers are on separate plants. The flowers themselves are very small and insignificant; the silvery colouring is produced by the bracts, which surround the flowers. The plants are wind pollinated with the male inflorescences in small tassels swaying in the wind, while the female flowers are at the base of medium-sized bracts, which catch the pollen from the air and funnel it towards the small, fringed styles of the female flowers. 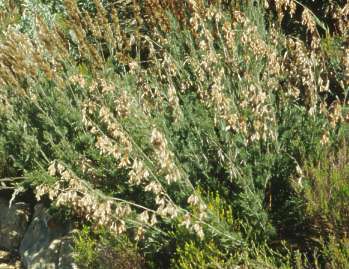 The plants produce a large amount of small, winged seeds. However, in common with most other species of the genus Thamnochortus, most of these seeds are not viable. The seed is stored in the upper layer of the soil and produces the new generation of plants after a large fire, but the plants also coppice from the base after afire. The economic use of plants of this family has been limited, as the plants contain a large amount of tannin and so are grazed only as a last resort by cattle and sheep. The species that have simple, unbranched stems are sometimes used for thatching, while the species with branched stems are used as brooms (besems). Thamnochortus cinereus has been in planted in gardens since 1994, when it was propagated and distribution by the Kirstenbosch Botanical Garden. This restio would look very good in a small group in a mixed border, in a group in a fynbos garden, in between members of the Protea or Erica families or in large landscaped areas around an office block. It will also look attractive in a pot on a patio or terrace. It is not known how it will react to cold, northern hemisphere climates. The plants are best grown from seed, which has a fairly good germination rate when treated with smoke or 'Instant Smoke Plus' seed primer. It must be taken into account that about half of the seeds will not be viable, so the seed will have to be sown in an even layer, covering the soil in the seed pan. This species should be grown in full sun, in a well-drained soil and have plenty of air movement around it. The plants adapt to a large variety of soil types. The best time for planting restios is at the beginning of the rainy season, as the plants need regular watering during the first six weeks to two months after planting. After this initial period the plants can survive with a little additional watering but grow better with a normal garden-watering regime. They may be fed with standard organic fertilizers such as Seagro, Kelpak or Bounce Back, or by sprinkling the surrounding soil with a small amount of ammonium sulfate during the growing season. The plants will initially be a bit slow to grow, but will have formed a handsome plant and flower three years after sowing. The plants produce a new growth flush in the centre of the plant every year. The individual stems start to deteriorate during the third year but by that time already two new flushes of growth will have appeared for the yearly renewal of the plant. 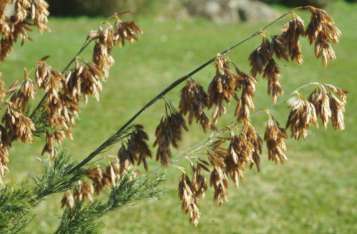 This governs the maintenance of the plant, which really only needs a regular removal of the brown, dead stems on the outside part of the plant. Haaksma, E.D. & Linder, H.P. 2000. 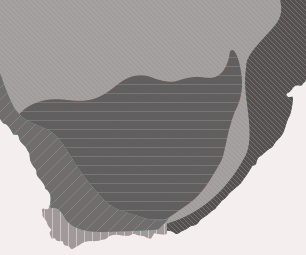 Restios of the Fynbos. The Botanical Society of South Africa, Cape Town..
Linder, H.P. 1985. A conspectus of the African species of Restionaceae. Bothalia 15: 387-503.